Have you completed an Integrated Water Management (IWM) project and would like to share the learnings with industry? Have you started construction on an IWM project and are excited to share the developments? With over 2,000 members within the Clearwater community, our case study section provides a great opportunity to share and promote your work with industry. 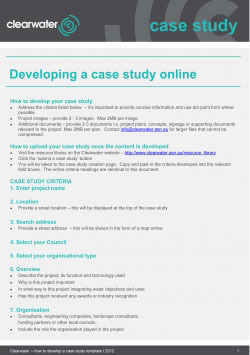 Whether you have just started your project or are near completion, the guidance notes outline the key criteria to consider when developing your case study to share online. We have provided a word version of the criteria you can download. Feel free to use this to help compile your content prior to uploading online. Please contact Clearwater if you have any questions about the criteria. Submit your case study online now.